This weekend we are expected to get about 8 inches of snow. If that doesn’t shout hot chocolate season, I don’t know what ever will! 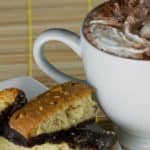 What is Italian hot chocolate and how is it different than regular hot chocolate? If you are not familiar with nutella (highly unlikely), it is a thick, smooth and spreadable chocolate with a hint of hazelnut. It is extremely popular in Italy and people everywhere use it in desserts, snacks, and all sorts of recipes… such as Italian hot chocolate. The recipe is very simple… simply heat the milk with the nutella over the stove ideally so you can stir it to make sure the nutella melts. Make sure the nutella has dissolved and it’s to your taste, then add some whipped cream on top. Okay, so I’m not sure the whipped cream is totally Italian, but since I’m Italian-American I’m giving myself a pass! Enjoy the recipe below! Keep in mind I’m using a cup of milk per serving. So adjust quantities accordingly. 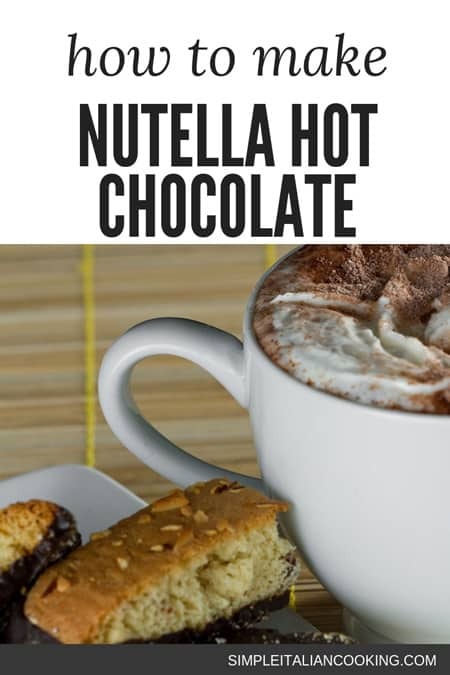 Quick and simple recipe for making Hot Chocolate Italian-style... with Nutella! To make enough for two people, simply double the recipe ingredients.